Like many people, the two great loves in my life are good books, and good food. What better way to integrate the two than to do a library cooking program? Of course, there are many ways in which to do this; I've compiled a list of ideas in which cooking can enhance your library. 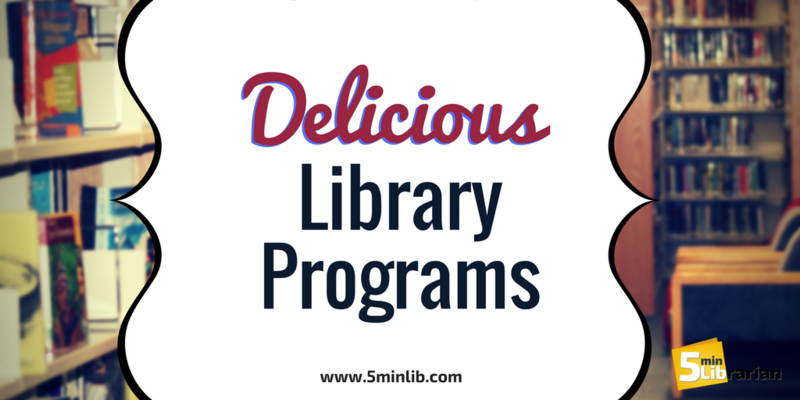 There are a couple different ways that I've seen cookbook clubs work in libraries. By Theme: Everyone finds and prepares a recipe that follows a certain theme (for example, cheese, cookies, vegetarian, Food Network Stars etc.). Participants bring their completed dish, along with the book it came from (or a printed recipe), to a meeting, and they can eat and discuss the various cookbooks and what they liked or didn't. Pros: you may get everything from Grandma's cheesecake recipe to the new and exciting Food Network stars. Also, you don't have to find many copies of the exact same book. By Book: Everyone uses the same book (or a choice of two or three pre-chosen books by a certain author or theme), and chooses a recipe to bring. Pros: It's easier to discuss the book itself (Were the directions clear? Does the food actually look like the photos? Did you like how it was organized?) if everyone uses the same book, and you get to try a variety of different foods from the same author. Cons: It may be hard to locate several copies of the same book, and you may have to have a sign-up sheet with different recipes, so you don't end up with everyone bringing the same dish. Whichever way you decide to go, it's probably a good idea to make sure that there is a copy of each recipe with each dish, so that people who like it may take one or copy one, and also to ensure that any allergies are accounted for. Is your book club getting a little tired of chocolate chip cookies every meeting? Perhaps it's time to add some themed refreshments! This is especially fun with books that have a very definite setting, whether somewhere in the world or in time; Jane Austen-era books would be perfect with tea and cucumber sandwiches, while international books may have regional cuisines that might suit. It would be easier for the librarian to have book club members alternate on who brings the refreshments, which means that each person is only responsible for bringing treats about once a year. I have done this with children's book clubs; while reading Rebecca Stead's When You Reach Me, we made sandwiches (the main character has a part-time job in a deli); when we read Maniac Magee by Jerry Spinelli, we had Tastykake Butterscotch Krimpets, which feature in the story. This helped the readers to connect to the story in a unique and memorable way. Whipped cream: you need a hand mixer for this one, but that's easy enough. Amaze the kids (I got a lot of "you can MAKE whipped cream?!") and then have them make ice cream sundaes. Make your own ice cream sundaes. Marshmallow treats - great for seasonal programs! Melt the butter and marshmallows in the microwave, stir in cornflakes and green dye for wreaths, chow mein noodles for bird nests (top with jelly bean eggs and Peeps), or Rice Krispies and rainbow sprinkles for a birthday confetti theme. Decorating cookies or cupcakes - always a blast. Dirt & Worms - mix chocolate pudding, cool whip, and oreos; each child gets extra crushed oreos and gummy worms to put on top. I always started with the rules: The first step is always "wash your hands," don't put your mouth on anything until we are ready to eat, parents can have some if there's any left once all the kids are served. Smoothies - I brought my blender in from home for this one. Take your taste buds on a ride with some delicious food tastings! Learn about chocolate, and try different brands and intensities (white, milk, or dark). Test different teas and see which one you like best. I went to a library program where different teas were paired with different cheeses - it was delicious! If you're not sure where to start, perhaps locate a local store that specializes in a certain type of food, and see if they're interested in collaborating. As a coffee fan, I would be very interested if a local cafe taught me the differences between blond roast, regular, and dark roast coffee, or what actually is the difference between a latte, cappuccino, and macchiato. You could also do blind tastings of different brands; perhaps one cheese pizza from each of 3 different restaurants could be compared, or see if patrons could tell the difference between generic and name brand items. We would love to hear from you! You can leave a comment here on this post, on our Twitter page, or on Facebook. Any word on food consumption/distribution policies? If we have presenters come in to do demos and samples, what type of licensing/certification requirements should be considered? Unfortunately, my research shows that every library is different. In most libraries, there have been no specific certifications required, but your mileage may vary. I would suggest asking your library director for your specific requirements.